At Cobalt Energy we have recently embarked on trials using innovative technology to gather Electroluminescence (EL) images of solar modules in daylight. We are now progressing this by working with European technology partners to gather module images in night-time hours. EL images can highlight defects and detail that visual inspection and IR (Thermography) images cannot detect. It identifies module and string failures, PID (also in the initial stage by applying different current values), bypass diode failures, soldering errors, high-impedance cell connectors, cell fractures, micro-cracks, manufacturing issues and many more. Aerial IR (via drone) may be a lot cheaper, but it won’t tell an owner half of the story, and certainly not enough to make any sort of warranty claim. Instead of traditional ‘darkbox’ EL techniques either in the laboratory or in the mobile test machines, night-time EL utilises high definition EL cameras, taking images of modules in darkness or low light timeframes. The strings still need to be powered with an excitation current to enable the electroluminescence to be seen, but this can be done by a mobile generator locally. There are a few marked differences between daytime and night-time testing but both have similar approaches. For daytime testing the technology is more advanced. This is because the EL images need to be calculated through a developed algorithm to filter out the daylight. Images captured from night-time testing are not only of a higher quality but the process itself allows four modules to be tested at any one time compared to traditional daytime EL techniques which only allows for one module at a time. With Daytime EL, it is possible to capture images of multiple modules at any one time by changing the camera angle. In night-time EL you can use a drone to capture multiple images of multiple modules. Applying night-time EL technique, we are able to capture four times the quantity of images compared to day at a better quality, these images are to laboratory standards. The financial benefits of working during the night are huge. For example gathering up to 500 images through daytime EL image capture will cost approximately £5 per module whereas night-time EL image capture aims to deliver up to 2,000 images per night, costing approximately £2 per module. The night-time approach means it is possible to test an entire site over a number of nights which is ideal for newly installed sites. This is definitely not the end of daylight testing though, the use of mobile EL machines still has its place, measuring module output. 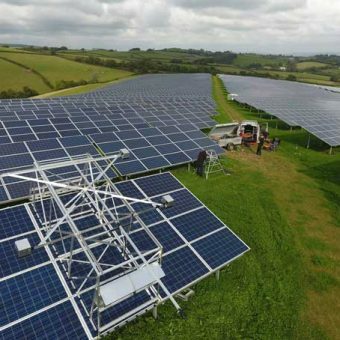 Knowing your module output means that we can ensure solar assets are productive and highlighting potential areas for increasing yield with an efficient and cost effective solar system. We believe that working alongside advanced technology partners, Cobalt Energy we are ready to deliver a fully commercial night-time EL testing service and are ready to roll it out across the UK.